I hate getting dinner for co-workers. I do my best to sneak out at dinner time. It’s because I’m a jerk..well, maybe a little, but I just hate the hassle. Multiple credit cards, only having a $20, odd requests…I just freakin hate it. The other night, I had to run an errand on my dinner break and a co-worker knew it. He was insistent that I pick him up dinner. I did everything I could to be nice about it, but he just wouldn’t let it go. I finally just got blunt. He still didn’t care. After I left, I got bombarded with text messages telling me what he wanted from a place I wasn’t even sure I was in the mood for. I finally relented and just did it to shut him up. My travels took me out to the Menards in Wyoming. 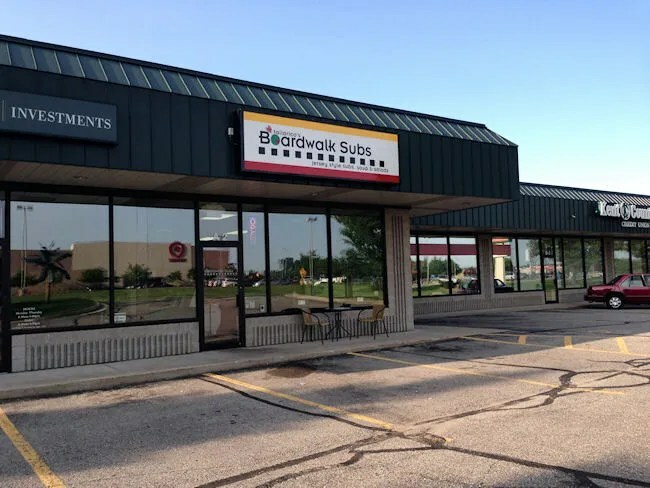 Near the intersection of Clyde Park and Gezon Parkway is a little sub shop. That’s what C.W. was asking for so after I made my quick stop at Menards, I headed through the Target parking lot to cross Gezon. 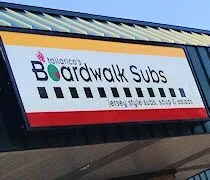 Boardwalk Subs isn’t new to me. I’ve eaten at the Standale location several times and really like the place. It’s similar, although not the same as Jersey Giant Subs. I didn’t realize there was one in Wyoming though so when C.W. started talking about it, I thought he was going to make me go to Byron Center. I was a little less annoyed when I saw that I was actually going to be close to one. The Wyoming location is a small shop with only a few tables. The large sandwich making area is right in front when you walk in. I glanced up a the menu board real quick to see what I wanted. I knew what sandwich it was, but I didn’t remember off hand what number it was. C.W. wanted the #17. The 16″ white bread bun comes with turkey, roast beef, prostini and Swiss cheese. The only thing he wanted as an add on was mustard and mayonnaise. Easy enough…..hope it doesn’t confuse the sandwich maker with mine. I ordered the #19 which is everything they have on a 16″ white bread bun. “Everything” is ham, capicola, salami, prostini, pepperoni, roast beef, turkey, and Swiss cheese. I asked for my sandwich to be topped with lettuce, banana peppers, Italian dressing, and herb de provance. After the sandwiches were cut and wrapped up, I paid for both sandwiches, which came to a little over $20. When I got back to the office, C.W. opened his up and was really happy. His pestering paid off and he got the sandwich he wanted. I, on the other hand, ended up with a sandwich with mayo instead of Italian dressing. I f”n hate mayo. I would like to kick whoever invented the disgusting concoction in the knees. So many good sandwiches have been ruined by this hideous train wreck of a condiment including this sandwich. I did my best and wiped off as much of the mayo as I could then stacked two bottom halves of the sandwiches together creating one huge pile of meat then just discarded the top halves of the bread. 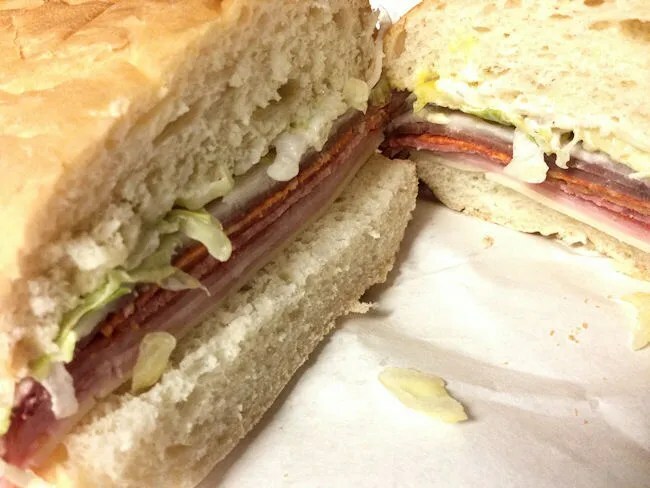 I enjoyed having that much cold meat in one bite, but I would have liked the Italian dressing and the top half of my sandwich. This just reiterates why I hate getting dinner for co-workers. Normally, I really like Boardwalk Subs and will make the trip out to Standale to get one, but when mayo ends up on my sandwich, I can get a little cranky…and that’s how this trip went unfortunately.